These doors at the end of the room were my achilles heel, my thorn in the flesh, the pebble in my shoe. I felt like Haman in the book of Esther, "But all this gives me no satisfaction as long as I see that Jew Mordecai sitting at the king's gate." We had transformed our kid's area into a beautiful scene right out of Bible times. But the satisfaction of all this was eaten away at everytime I walked into the room and saw those white doors glaring at me. One day, one of our out of the box thinkers, Scott, happened to be in the center helping. I voiced my grievance over the doors that stood out like a sore thumb (to me anyway!) and how I wanted to put plexiglass windows in them or something to get rid of their starkness. He thought for a few minutes and then said, "What about those stained glass windows we took out of the sanctuary a few years ago?" Viola! An idea was born just like that. I asked my husband/Pastor what he thought of the idea. While Scott lives outside of the box, my husband lives in the box! And he loves it there. So when he agreed, without so much as a batting an eye, I knew this was God's direction. 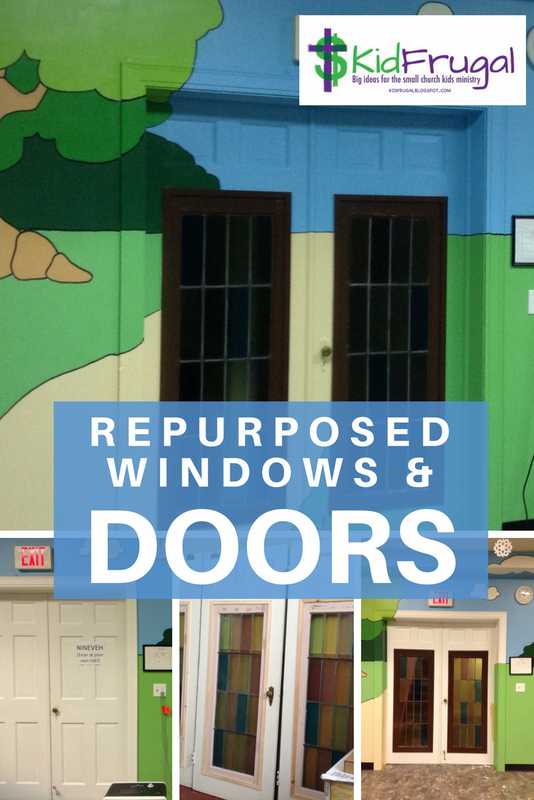 Another one of the men in our church took home the doors and windows and transformed them. It took another couple of months after they were hung until we reached Nirvana. We painted the scenery in at first around the door jam, and then finally all the way to the windows. Now I love how our doors look. An unexpected blessing was that all the people who had grown up with the windows and loved them, got to see them again. They were thrilled when they appeared in the downstairs doors to our J.A.M. Center. This did not happen over night. I complained and prayed and asked people for help and ideas. In fact, I might have been mistaken for Phil Harris in White Christmas when he kept trying to get Bob Davis hooked up. If I didn't know better, I could have sworn I heard people saying the same thing Bob told Phil, "You've ootzed me along every step of the way. You hammered, drove, pushed, shoved. And if that wasn't enough, you looked at me with those great big cow eyes of yours..." Well, God finally brought a solution and I think it was worth the wait and ootzing. Now, if I could just get the stage area figured out and completed at the other end of the room. and I'd melt and go along!